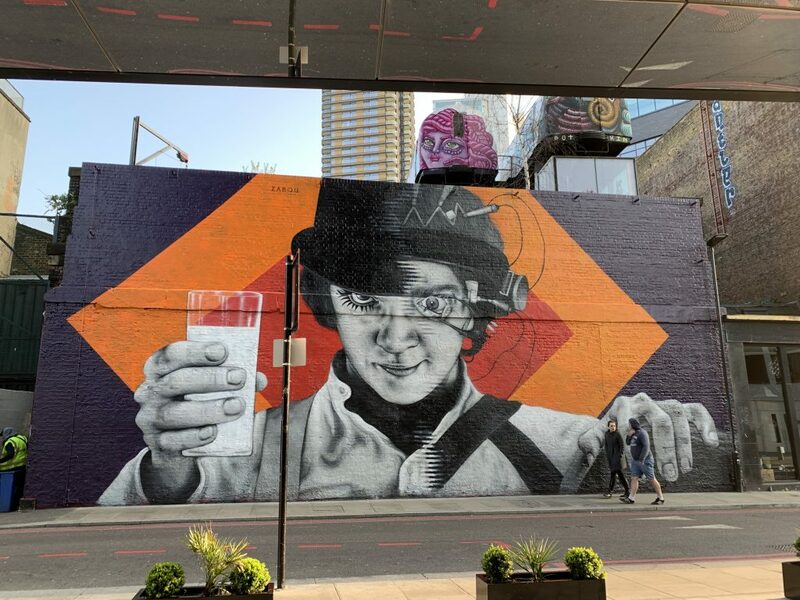 If you’ve wandered down Holywell Lane in the past week you will no doubt have noticed our newest mural of controversial cult icon Alex from A Clockwork Orange – one side of his face the bloodthirsty sociopath, the other the tortured prisoner. 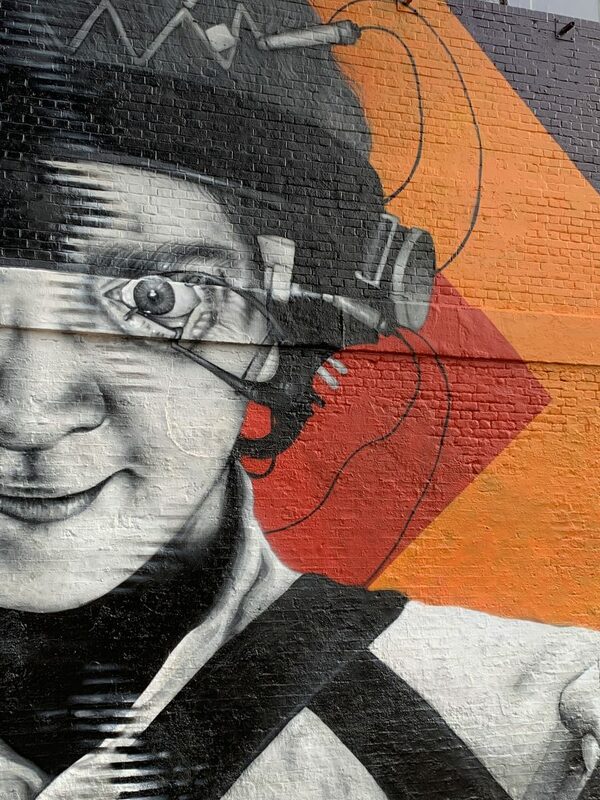 We caught up with Zabou, the artist we invited to paint the wall, to talk about her style, her inspiration for the piece and what goes into making something so realistic. French artist Zabou has been based in East London for around eight years starting her life as a painter of small works, using stencils mainly. 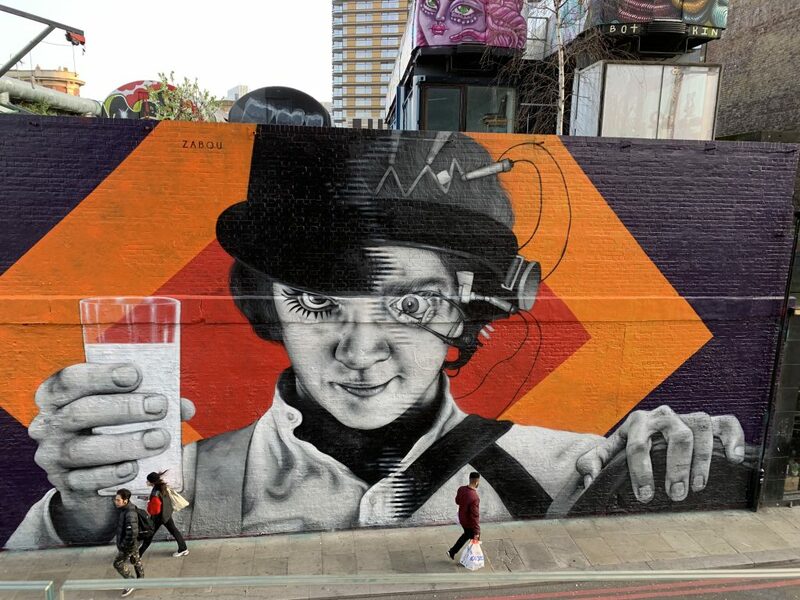 Once you’re familiar with Zabou’s style, you’ll forever recognise it (maybe you’ve seen her mural of Sherlock Holmes, David Bowie or Salvador Dali). But what response is she after with her work? “Sometimes I like to paint someone anonymous, just if they have an aura. But sometimes I like to select someone famous or iconic. The cool thing is I mostly have total freedom about what I am going to paint. There are so many characters I want to depict and talk about! 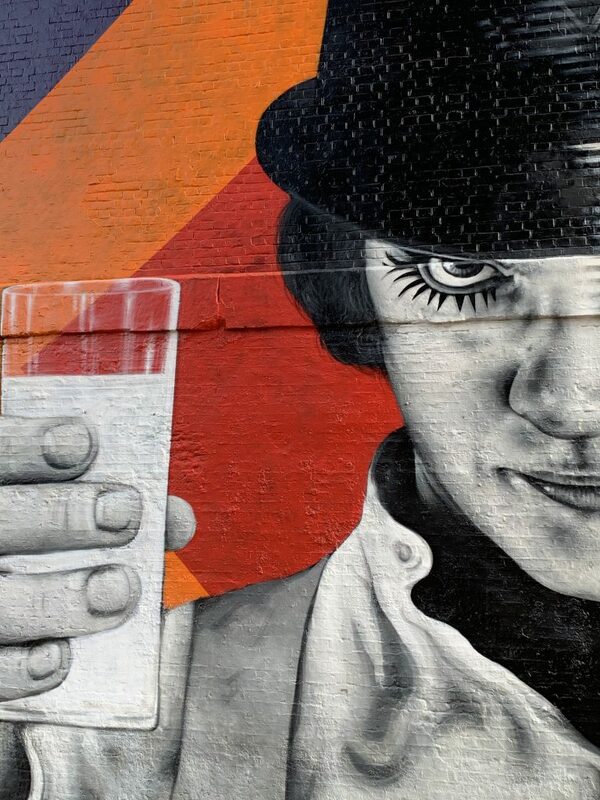 We move onto talking about the film A Clockwork Orange’s difficult history in the UK, having been banned by Kubrick himself, after the film was allegedly responsible for copycat violence. Does painting Alex contribute to him being made an icon (a problematic thing for some)? What was behind the idea of the split effect? It’s this split face that gives the audience/spectator interaction that Zabou is after. Even approaching it from a certain side will give you a different first impression. Zabou went on to explain the technical aspects of the work and how she creates such realistic portraits. “I use spray paint and each can has a specific shade of colour. You can’t mix too much. You can blend them a little bit, but it’s not like acrylic paint where you can just take black and white and make all sorts of greys. So I have to use a whole range of grayscale. I start with the darkest areas of the face then I build up to the light and brightest. How many types of grey are we talking? “Usually I don’t do geometric patterns, but a colourful background – it could be a city-scape or flowers etc. I rarely do geometrical because it’s such a pain! You need masking tape and there needs to be two of you. It looks simple but it’s so hard to do sharp lines. 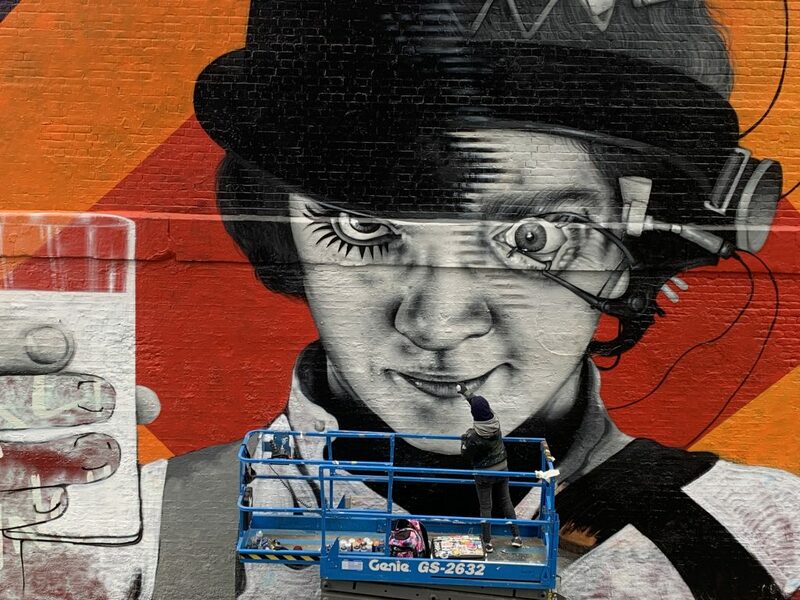 ‘The Glitch (Clockwork Orange)’ will be on our Holywell Lane wall until the end of April. And if you’re as into Zabou’s work as we are, make sure to follow her socials to see what’s she’s got coming up.